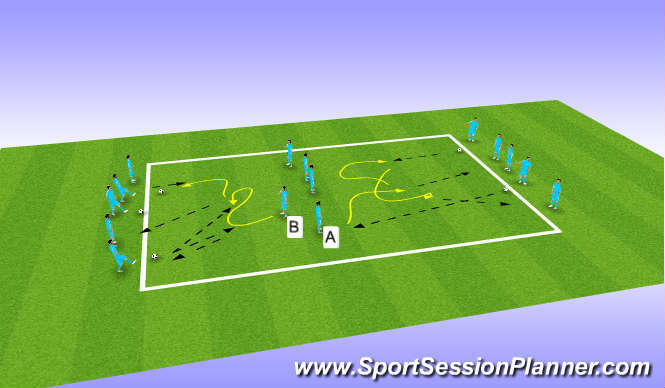 Session Objective: To improve passing and receiving. Five players on each end of area.Five players in middle,two facing one way,three other way. (You vary numbers according to group size but need middle group to be starting with players facing each way).Rotate groups after three or four minutes depending on age. Balls with players on outside.Development a)Ball played in to player A in middle who receives ,makes movement with ball and plays back to another player on same side who does not have ball.Then makes movement away towards middle of square, turns and then moves to receive ball of another player on same side.Then repeat,making movement with ball and plays back to player on same side who does not have ball. 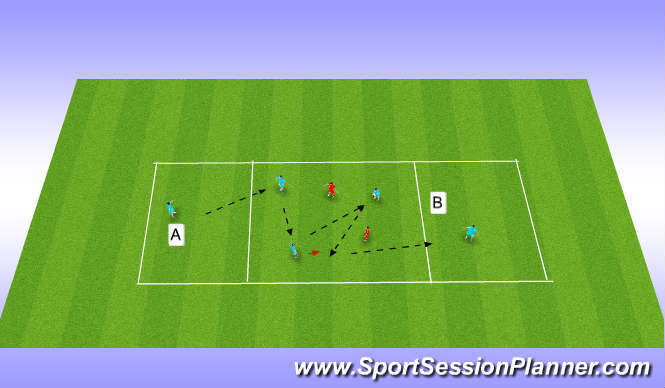 Development b)Player in middleB receives ball but plays ball back to same player.Drops off and then comes to take ball again off same player and then makes movement away towards middle of square, turns and then plays ball to another player on same side.Then repeats, collecting ball off available player. Movement and shape to receive.Touch.Head up and awareness.Quality of pass.Head up to look for next ball. 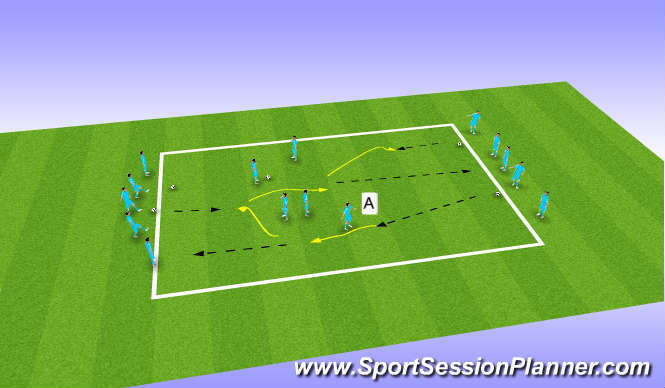 Session Objective:To improve passing and receiving. Organisation:Five players on each end of area.Five players in middle,two facing one way,three other way. (You vary numbers according to group size but need middle group to be starting with players facing each way).Rotate groups after three or four minutes depending on age. 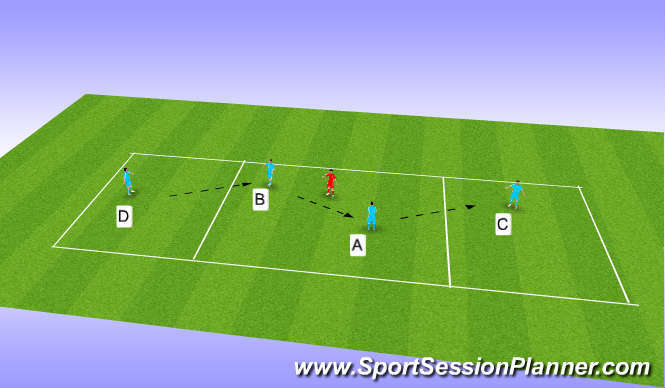 c)Ball played in to A who receives ball on back foot,turns and moves towards opposite end of square.Plays ball to player then moves to receive ball off another player on same side,takes on back foot,turns and then takes to opposite side.Plays to player then receives another ball on back foot,turns and so on. 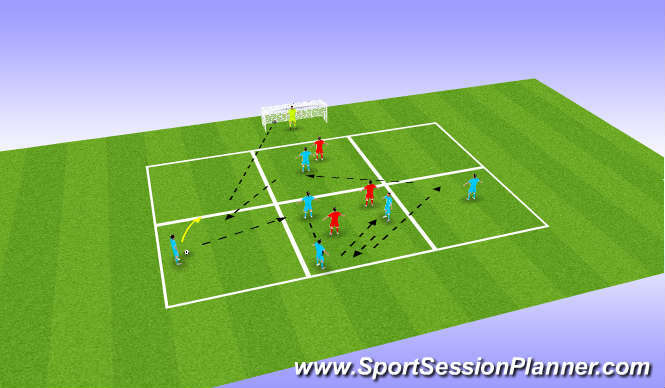 Session Objective:To improve passing and receiving. (Shutter drills). 2 v 1 in centre,player each end.Ball played in to either blue player who receives and plays to other player who plays to end Red player moves to oppose but does not tackle at first.Work on movement of players to receive and movement after pass made.Repeat from each end. Develop:If A plays ball in to C or D it must be B who receives and vice-versa.Encourage movement after playing ball for both players. Develop:A and B must make given number of passes e.g.4,5 before playing to endplayer. Develop:A and B make given number of passes but can pass to either C or d (i.e. are keeping possession but playing back if required. Develop:When ball played to C, A takes place and C enters square. B has moved appropriately to create angle with C.
Create space;angles and distance to receive.Know where space is and move ball to space.Quality of pass;Movement BEFORE receiving ball,control WITH ball,movement AFTER playing ball. Increase to 3v2 in middle.Passing movements as before,from end to end.Vary conditions:e.g.number of passes in square,must play a 1-2 before ball can go out,play and take place of A or B on outside.Coach can be creative and vary accordingly.Can develop to 4 v 2. Session Objective:to improve Passing and shooting from shutter drills. Organization as before but include forward player and extra defender.Movement in and across square but once required number of passes achieved,ball can be played to forward A who sets up either B or C for shot.Emphasis is on keeping possession,then playing in at right time to forward who lays off in one touch for a quick play finish.As players rotate to take place of B and C all will have shot eventually. Angles and distance to retain possession.Movement before ball,with ball and after pass.Decision making when to play forward.Quality of lay-off,technique of shooting.